What are the pension recycling rules? What are the pension recycling rules? What are the pension recycling rules? I’ve had a notable increase in people asking me about pension recycling rules since April. The new reforms which allow full access to pension funds have spurred many to think about potential tax loop holes in the system. The source of the inquisition is usually from a friend down the pub and the nature of the query is to see if there is any substance or advantage should they act now. It’s fair to say that it’s not a widely understood rule and there are different ideas about what it is. 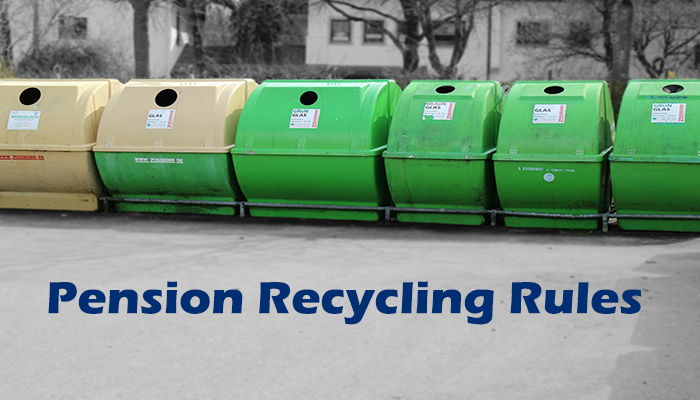 The official pension recycling rules refer to the recycling of tax free cash. As up to 25% can be taken from a pension tax free, and it’s common knowledge that there’s tax relief at your marginal rate when putting money into a pension, so there seems to be a short-cut to free money. Let look at a theoretical example. £100,000 pension fund. £25,000 taken tax free. £25,000 put back into a pension @ 20% relief would equate to £31,250 an instant £6,250 windfall. Now, 25% of this £31,250 could be taken out tax free which is £7,812 and the rest would be taxed at your marginal rate. So if you were still a 20% taxpayer after adding £23,438 to your earned income, you’d receive £18,750 after tax. £18,750 plus £7,812 is £26,562. So for your recycling efforts you’ve made £1,562. If you were a higher rate tax payer when you put the money in and basic rate when you took it out, it looks more attractive. £25,000 with 40% relief is £41,666. After paying basic rate tax on the remaining £31,250 this leaves £25,000 net. £25,000 plus £10,416 is £35,416 which provides an uplift of £15,416. Looking at these figures it’s easy to see why people think this is a loophole worth exploring. Not so fast. HMRC are well aware of this and have put together a set of rules which if you disobey, could cost you 70% of the value of your tax free cash. HMRC don’t want people doing this and have therefore set out various means to detect if its happening. If your pension contribution increase significantly from normal, this will ring alarm bells with HMRC as to why. They will look to see if you’ve recently taken pension benefits. For those who have savings which they put into a pension as a lump sum, to be replaced by the tax free cash at a later date (with the intention of recycling), HRMC can still impose a 70% tax charge. If there’s evidence that the recycling was intentional, they’re going to charge you. The revenue count a 30% increase in pension contributions as ‘a significant increase’, they also measure it over 5 years to expose gradual increases. Pension recycling of tax free cash is therefore frowned upon by HMRC and be prepared to get caught if it’s obvious you’re doing it. The method of recycling which isn’t frowned upon is that of income payments. Many people take a lump sum from their pension early and continue to work. If they’re a higher rate tax payer and taking income from an annuity, there seems little point in paying 40% on it. A wise decision would be to channel this income into a pension, regain the 40% relief on input and wait until they’re a basic rate tax payer before taking an income. Although there is a clear tax advantage of doing this, HMRC don’t deem this to be taking advantage of the rules. Having said that, there are rumors around the pension industry that a flat rate for pension contributions may soon be imposed.